One of the great joys of being an avid reader is the serendipitous discovery of a little gem, a book you probably would normally have never found and read if you hadn’t gone to that book festival, or popped into that bookshop, or sat opposite that person on the train. I had not heard of Mr Wigg by Inga Simpson before I attended the recent Byron Bay Writers Festival on the lovely New South Wales coast in Australia. It’s probably not surprising as she was part of a panel discussion called Bursting on the Page: fabulous first fiction. 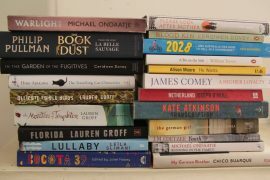 I wouldn’t put Mr Wigg in the same category as Burial Rites (Hannah Kent’s powerful first novel) or We Need New Names by NoViolet Bulawayo, which is long-listed for the Booker Prize, but I loved its gentleness and its enchanting whimsical riff. Mr Wigg has spent his whole life cultivating fruit trees at his property in New South Wales in Australia with his wife until her recent death. Time is moving on. It is harder and harder to work the orchard productively but there is still time to enjoy the luscious fruits that have been his world for decades. Long estranged from his daughter, he has a prickly relationship with his son, who believes even the scaled down farm is too much for the elderly man. It is the enduring presence of his wife that continues to provide the rhythm of his daily life and his grandchildren that keep the fantastical magical world of the Peach King alive. And, though his hands are beginning to shake, there is still one project to finish. Mr Wigg is a delightful textured book that lives up to its sub-title: A novel that celebrates the small things in life. Small, but not unimportant. I read your review, bought the book and have started reading…..it is delightful. Thank you!